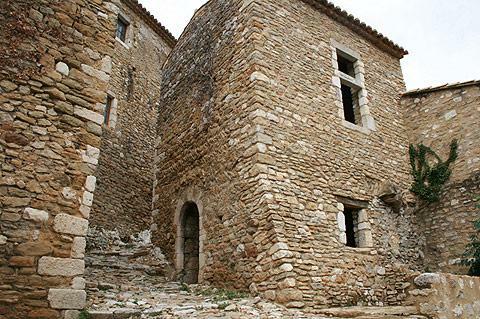 Saint-Montan is located in the southern Ardeche, north of Bourg-Saint-Andeol. It is inscribed as an Ardeche 'village of character'. It is interesting to note that almost the entire medieval village had fallen to ruin and was completely uninhabited until the 1970's when a major project of rebuilding began which took many years and involved thousands of volunteers. So almost all the old village of Saint-Montan we love today is less than 50 years old, but rebuilt using traditional techniques and materials! This small hillside village has a castle at the top of the hill with the narrow streets of the village sprawling below down to the small river and a few shops and restaurants commerces at the bottom. 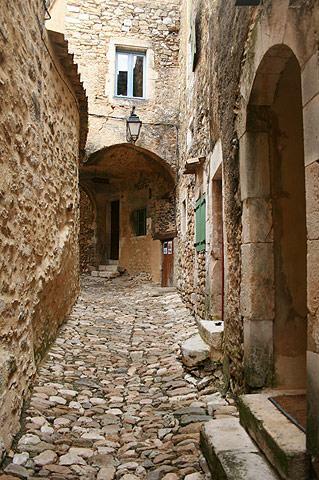 The old part of the village is not accessible to cars, and has been extensively renovated. It consists of a maze of steep cobbled alleys and paths, vaulted passageways, and a great deal of picturesque old houses. At the top of Saint-Montan the medieval castle is very extensive - almost as large as the village itself - and you can see the substantial walls and several towers. 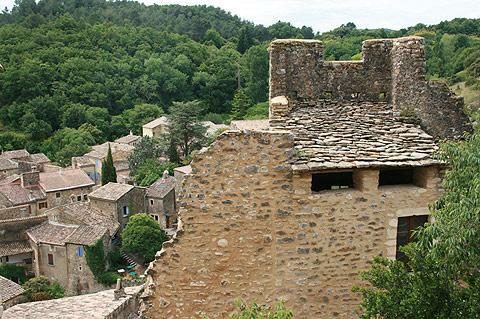 Throughout your visit there are lovely views across the rooftops of houses in Saint-Montan and the surrounding hills. 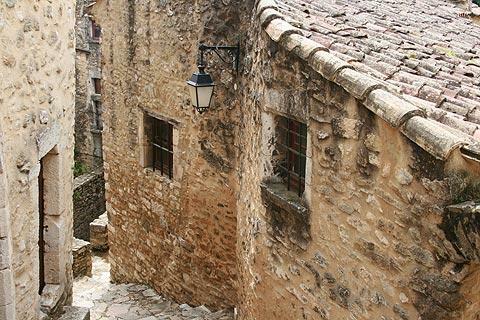 (The village was perhaps more reminiscent of a Provencal perched village than the other Ardeche villages of character.) There are also two small 'roman' style chapels to visit - the chapels of San Samonta and Saint-André de Mithroys. Although only a small village there are various restaurants and other shops in Saint-Montan, in and around the main square below the old part of the town and in the lower parts of the ancient streets. ...but despite these problems I have to concede that Saint Montan was an unmissably atttractive little village, but I recommend you arrive early to avoid spending hours in the car getting hot and bothered. Various marked walks and trails are available in the hills around the village to enable visitors to better discover the surrounding countryside. On leaving Saint-Montan I followed the winding road out of the village towards Larnas. This is a very scenic route winding up into the hills and is also recommended. Bring a picnic! 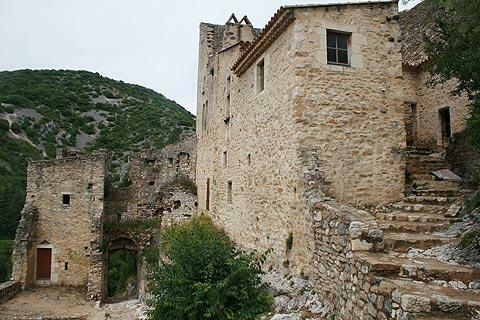 If you enjoy visiting ancient villages we suggest you also include Alba-la-Romaine to the north of Saint-Montan and Aigueze to the south as part of your itinerary as well as a drive along the north rim of the Gorges de l'Ardeche.